The Trinamul Congress is approaching toady's municipal elections with the twin challenges of denting the Gorkha Janmukti Morcha's hegemony in the Darjeeling hills and staving off the BJP elsewhere. In Darjeeling, Kalimpong, Kurseong and Mirik, the ruling party hopes to build on the gains from chief minister Mamata Banerjee's frequent visits to the hills in the past six years and announcement of development projects. In Raiganj (North Dinajpur), Domkal (Murshidabad) and Pujali (South 24-Parganas), Trinamul's primary task is to ensure that the BJP does not make significant inroads. Trinamul sources said Mamata wanted her party to improve its performance in the Darjeeling hills. The Morcha had won the Darjeeling, Kalimpong and Kurseong civic bodies uncontested in 2011. In Mirik, the party had won all seats. Mamata has deputed several senior leaders under her trusted lieutenant Aroop Biswas for the civic elections in the hills. They have been campaigning for the past few weeks. 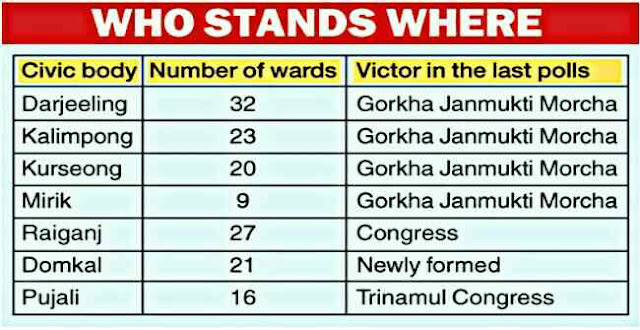 Bimal Gurung's Morcha is yet to lose an election in the hills since the outfit was formed in 2007, but Mamata has been trying to turn the tide with visit after visit. The chief minister has formed 15 development boards for various hill communities, upgraded Kalimpong to a district and Mirik to a sub-division. She has promised land rights to residents of Mirik town and taken up a slew of development projects in the region. Trinamul ceded to the Morcha the initial momentum in the campaign thanks to a faux pas by minister Indranil Sen. He said at a rally in Darjeeling on May 5 that Morcha leaders Gurung and Roshan Giri would be packed into steel trunks and sent outside Darjeeling. The Morcha, which has given a "Gorkhaland-versus-Bengal" twist to the electoral fight, milked Sen's comment to spark an outsider-versus-local debate, putting Trinamul on the back foot. "That statement did damage our chances. Land and identity are sensitive issues here," a senior Trinamul leader said. "The Morcha's victory here will not be the party's alone. Its ally BJP, which has not fielded candidates as a friendly gesture, will claim credit too.... That will be worse than a defeat to the Morcha," he added. The Trinamul sources said Mamata would be "very disappointed" if the hard work failed to make any impact in the hills. "At least a decent outcome will mean we have been doing something right, politically and administratively," a Trinamul leader said. He said Trinamul was "confident of forming the board" in Mirik, besides Raiganj, Domkal and Pujali. The BJP's challenge will be to prove Trinamul wrong. While it can only cheer for the Morcha in the four hill bodies, it has worked hard in its campaign in the other three. The BJP is keen to relegate the Left and the Congress to the sidelines in Raiganj and Domkal and put up a stiff resistance to Trinamul in Pujali. "The seven civic bodies will cause sufficient grief to Didi. She won't be able to get a toehold in the hills and two of the other three civic bodies (except Pujali) will not go her way," a BJP state committee member said.